THE Ulster Wildlife Trust (UWT) has welcomed the NI Assembly’s renewed commitment to protect one of Northern Ireland’s most prized natural resources. Both the Department of the Environment and the Department for Agriculture and Rural Development have agreed to sign-up to a new restoration plan for Strangford Lough, which aims to restore its unique horse mussel reefs, which once extensively covered the seabed, to their former glory. Despite the Lough’s numerous international designations and protections, attempts to protect this special habitat over the last two decades have systemically failed. Horse mussel reefs in Strangford Lough are now to get full government backing to ensure their survival and that the biodiversity of the lough is protected. A recent complaint by UWT to the European Commission resulted in prompt action by both Departments to resolve the situation or face substantial infraction fines, with the protection and restoration of the reefs now of international interest. The horse mussel reefs are a key feature of Strangford Lough’s designation as a Special Area of Conservation and provide vital spawning and nursery grounds for hundreds of creatures, including commercially fished species. The new plan includes commitment to a ‘Total Protection Zone’ which will restrict any potentially damaging activity such as fishing, diving, anchoring and mooring within a defined area. It also includes a permit and tracking system for pot fishing, along with potential physical intervention measures such as the movement of horse mussels, to speed up the restoration process. A range of monitoring and educational activities will also be put in place. Dr Jade Berman, Living Seas Manager with the Ulster Wildlife Trust, said: “We are extremely heartened by the political support and commitment by both departments, and the Environment Committee to give this vital natural resource the protection it deserves. Strangford Lough is recognised worldwide for its remarkable wildlife and takes pride of place as a unique visitor attraction and place to live and work. “Fisheries are without doubt an important part of the local economy of Strangford. We understand that this period of transition to protection and enforcement will be challenging. However, this new plan is not anti-fishing. It’s about securing a sustainable long-term future for the Lough and all its users, before it’s too late. “Marine ecosystems are very complex and there is no one quick fix solution for their recovery. The restoration plan is a great start, but there are still details that need ironed out to achieve the protection required. This will require both departments to work together to ensure a joined-up vision and provide the necessary support measures to secure the future prosperity of Strangford Lough – for both people and wildlife. The UWT first issued a complaint to Europe in 2003 which resulted in a permanent ban on trawling and the development of a restoration plan by DARD and DOE to avoid infraction fines. £1 million was paid to fund this work form 2008 – 2011, but the objectives including total protection for the reefs was never achieved. 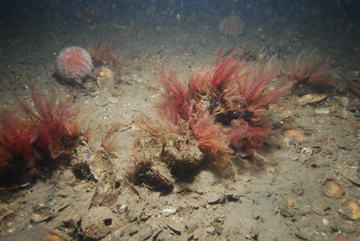 The horse mussel reefs (Modiolus modiolus) are a key feature of Strangford Lough’s designation as a Special Area of Conservation which requires protection under the EC Habitats Directive. The reefs provide vital spawning grounds and nurseries for hundreds of creatures including sponges, soft corals, starfish and commercially fished species such as lobsters, crabs, scallops and oysters. The UWT presented evidence to the Stormont Environment Committee on the Revised Restoration Plan on Thursday 25 October. This followed on from a Committee motion debated by the Assembly in January which called for the environmental and economic sustainability of Strangford Lough. A report issued by QUB in May 2011 on the progress of the restoration plan, showed that horse mussel reefs are continuing to decline and recommended immediate action for total protection of the remaining reefs ( or non- disturbance zone). The UWT lodged a complaint to Europe in November 2011 which centred on both the Assembly departments failure to protect the horse mussel reefs and their continued breach of the EC Habitats Directive. This complaint is currently part of a pre-pilot process which is a precursor to legal infraction proceedings if the issue is not resolved to the satisfaction of the European Commission. The Stormont Assembly could face a bill of millions of pounds from Brussells if it does not comply.